At Fence Workshop™, we want to provide information about not only our fence materials for purchase, but all types of fencing in an effort to help educate on best practices and what to look for when choosing an installer. If you are interested in purchasing and installing a Cedar wood fence, read on for information that will help you get the most out of your material and installer. Cedar fences look great, smell great and hold their dimensions better than pine. Cedar lumber is naturally resistant to insects and rot! Because cedar is more dimensionally stable than pine, it makes for great pickets. As a rule, any pine privacy fence can be upgraded with cedar pickets. The natural oils in cedar help make the wood material resistant to decay and insect attack, increasing its durability and weather-ability without the use of chemical treatments. In fact, much more so than other woods so there is minimal shrinkage and warping. This fact alone is why the use of Western Red Cedar is suggested for all custom wooden driveway and pedestrian gates . The reasoning for this is due to the lighter weight of the cedar; it helps to prevent sag over time. Above all, the cedar wood has a beauty all its own with colors, grains, and textures unmatched to other fence materials. If you want colors other than cedar’s own natural tones, the wood can easily be stained. Properly constructed and maintained, a cedar wood fence will look good for many years to come, adding prestige and value to your home and garden. Cedar’s natural beauty and durability lends itself well to any formal or informal landscape and environment. 1. Cedar is not likely to warp. Cedar lumber is much more dimensionally stable than pressure treated pine lumber. Whether used horizontally or vertically, cedar lumber excels at holding it’s shape. 2. Decay resistant. Western Red cedar has a life span of 800 years of more. This due to naturally occurring fungicidal compounds called thujaplicins. These compounds fight decay-causing fungi, making cedar a leading choice for fencing lumber. 3. No-Bugs. Cedar has a strong, distinctive smell of cedar oil, which is a natural insect repellant. From mosquitoes and moths to termites and flies, cedar repels almost all bugs (this is why cedar is commonly used in closets). 4. Light and strong. Cedar is classified as a softwood but is actually 80% the strength of oak and up to 35% lighter than redwood. 5. Virtually waterproof. Cedar lumber can absorb and release water, condensation and moisture while maintaining equilibrium with the surrounding atmosphere. This unique trait is known as hydroscopic and is the reason why cedar can withstand such heavy rains and moisture, and can even be used in luxury bath tubs. 6. Acts as a sound barrier. Cedar is commonly recognized for it’s sound-blocking qualities. 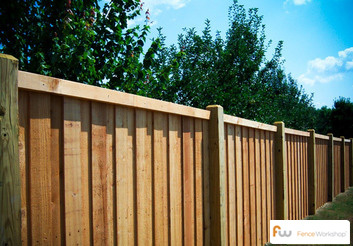 Cedar fencing has up to 70% of the noise suppression abilities of a solid concrete wall. 7. Free of pitch and resin. Pitch and resin prevents a lumber’s ability to properly bond/adhere and be stained or sealed. Western Red cedar is free of pitch and resin. Most quality cedar fences will be fully constructed on-site. Pre-assembled panels are not recommended as it is hard to determine the standards in which they were produced and the quality of wood that was used. Due to its underground weather-ability and lower cost, we suggest that pine posts still be used when constructing your cedar fence here in the Southeast. Cedar fencing is typically going to cost you a bit more than to use Pressure Treated Pine material, but some customer’s will find it worth it for the extra benefits. Think about what you want to achieve with your fence and how much upkeep you want to invest and make an educated decision from there.